And the biggest Time Trap Women Face That Keeps Their Plates Far Too Full is… Saying ‘Yes’ when You Really Want to Say ‘No’! What does Saying Yes When You Really Want to Say No mean? Have you ever accepted an invitation to an event then when the day came all you wanted to do was stay home and rest? Have you ever offered yourself up for a committee or group because you felt obligated but didn’t necessarily want to? Does your schedule consist of events and tasks that drain you more than they fill you up? This is what ‘saying yes’ looks like when you deep down wish you could say no. Saying yes when you really want to say no is all about not setting healthy boundaries and not taking care of yourself. 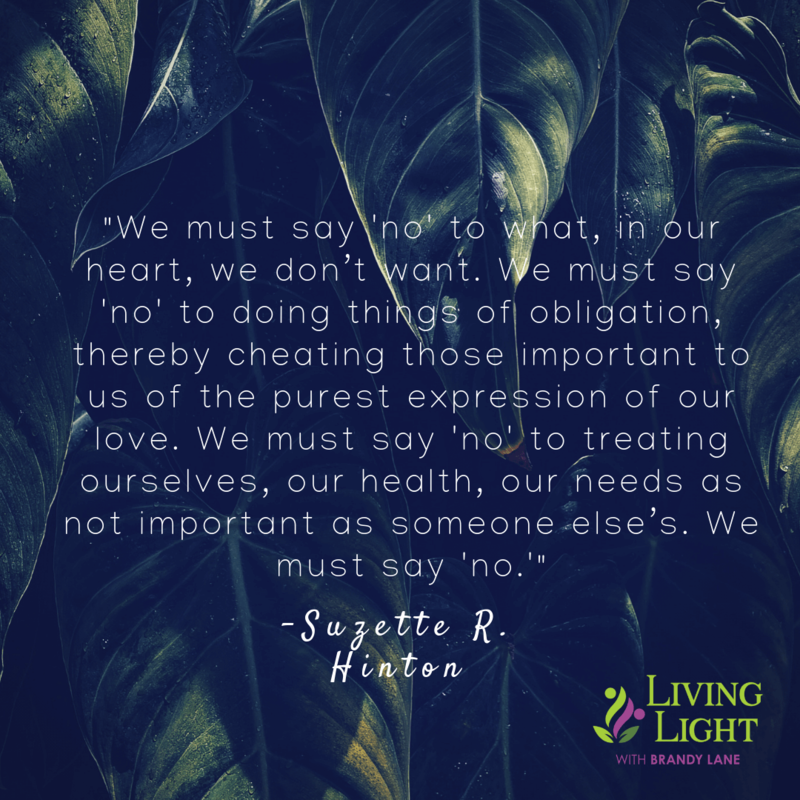 We often wish there was someone in our life that would give us permission to say no. Setting healthy boundaries is being that person for yourself. It is the mindset that being a caregiver means taking care of others at the expense of ourselves. But remember: we must put the oxygen mask on ourselves before we help someone else. That makes saying ‘No’ to say ‘Yes’ to yourself a little more imperative, doesn’t it? It is the mindset that if we are committing ourselves to others, we won’t need to think about our own feelings, needs and experiences. Sometimes these are too overwhelming or painful to deal with, so we busy ourselves with others. But those feelings won’t dissolve into the “busyness”. While care for others can help us work through some of our own pain and trauma, we need to set healthy boundaries to ensure our needs and feelings are being met. What does not setting Healthy Boundaries look like? You are exhausted constantly doing things for others and their agenda, leaving you little time to do what you want or need for yourself. This can you leave you in constant fatigue. You are a people pleaser and say yes all the time so you won’t let others down. You feel responsible for others being happy and constantly feel guilty or anxious when the people around you are upset. Relationships in your life are difficult, dramatic or not equal in energy (i.e. you are putting in more than you are receiving). When faced with decisions, you don’t know what to do. You have lost who you are. Your personal radar may be off and you may have some intimacy issues. You find it difficult to share enough of your needs and feelings with people who are close to you. What Outcomes does it set us up for? What does healthy boundaries mean? Healthy Boundaries are the limits you decide work for you on how people can treat you, how they can behave around you, and what they can expect from you. Our beliefs and values will guide all that we allow to happen around us. These beliefs come from of all our experiences and social environments we have lived in, both good and bad. You may have a belief such as “I must do as much as I can for others in order to be appreciated.” This could have stemmed from a parent or mentor who selflessly gave and never took time for themselves. Because that person gave so much to you, you internalize that belief and keep it close to yourself. But this is what I like to call a limiting belief. Limiting beliefs constrain us and do not serve us. Take time to reflect on what may be a ‘limiting belief’ in your life. There are often times expectations that we put on ourselves such as “I must always be busy or I am not achieving” or “I can’t take time for myself because I will not have time to take care of my friends/family”. Setting Healthy Boundaries is not necessarily a matter of getting rid of the belief altogether, sometimes it’s about reframing and reworking the belief to become self-supporting. Instead of “I can’t take time for myself because I will not have time to take care of my friends/family” we can shift it to be “Taking care of myself will allow me to take better care of my friends/family”. Setting Healthy Boundaries and encouraging self-supporting beliefs give us the space to grow and be ourselves. How do I Start Saying No so I can Say Yes to Myself? A simple place to start is not saying ‘Yes’ right away. In a society of instant messaging and quick replies, there is pressure to have an answer right away. When someone asks something of you, take a moment to pause before replying at all. The more you give yourself permission to do this, the more comfortable it will become. A tool I learned from my therapist a long time ago was to carry a piece of duct tape in my pocket. This was to remind me in situations that I don’t always have to speak. I can set ‘silent’ boundaries with people and situations that drain me more than they fill me up. Maybe this can work for you, having your duct tape in your pocket to allow yourself the space to say, “Can I get back to you?” or “Not right now.” And pausing before you respond may give you clarity to say ‘Yes’ to the things you really do want to say ‘Yes’ to, which feels good too! A great resource that I recommend is the book “Essentialism” which gives you tools for narrowing down what is important to you and what you want to prioritize in your life. It is all about saying no when it is not right for you. You have to start empowering yourself. If you say yes to things you don’t really want to do you will not have time for self-care and what is your true priority. Start saying no so you can say yes to yourself.